Use it to claim community water fluoridation (CWF) is harmful – even if this requires misrepresentation or distortion of the studies findings (a recent example is the prenatal fluoride/child IQ study of Bashash et al., (2017) heavily promoted and misrepresented by Paul Connett in his current New Zealand talks). Viciously attack the study if it finds CWF beneficial and reports no harmful effects (remember their reaction to the NZ IQ-Fluoridation study of Broadbent et al., 2014). Do their best to ignore the study if it can’t be misrepresented and the media is not reporting it. Well, now we have a very new study from Iran reporting relationships between drinking water fluoride and thyroid problems and already we can see activists launching into reaction 1. Kheradpisheh, Z., Mirzaei, M., Mahvi, A. H., Mokhtari, M., Azizi, R., Fallahzadeh, H., & Ehrampoush, M. H. (2018). Impact of Drinking Water Fluoride on Human Thyroid Hormones: A Case-Control Study. Scientific Reports, 8(1), 2674. So what did this study find? The paper itself is a little difficult to read but here is what I got from it. To avoid confusion, Waugh is referring to this study. Scientific Reports is a Nature journal. Incidentally, I do try to follow anti-fluoride activists on social media but did not see this myself as Declan Waugh blocks me. This was brought to my attention by a colleague who was probably more concerned about Waugh’s resorting to blaming homosexuality on fluoride – see the image of Waugh’s Facebook post. Citation dredging of the sort Waugh indulges in certainly makes one susceptible to these sort of claims – especially if they “confirm” a bias. The study is already being used by groups like UK Against Fluoridation and Fluoride Free NZ who cite the paper as evidence of harm – but seem not to understand the paper and simply quote sections dealing with thyroid hormones and not the findings on the lack of effects on hypothyroidism prevalence. The study did report statistically significant differences in hormone levels. I am not an endocrinologist so will not get into a discussion of what these changes might mean. Here I will simply present them and compare them with hormone levels considered normal. The authors investigated the T4, T3 and TSH hormones. No significant fluoride effects occurred with the T4 hormone. A very small effect occurred for the T3 levels in the control group (no hypothyroidism present) – the authors claimed this was statistically significant but I find that hard to believe – see Figure. 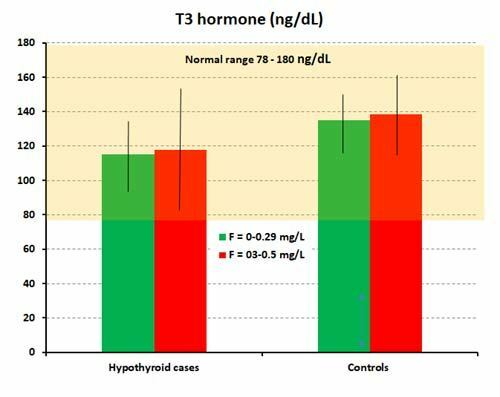 The T3 hormone levels were within the normal range (yellow area) for both groups. It’s not surprising to see different levels in the hypothyroidism cases. But drinking water fluoride has no significant effect there (p=0.19) – and I am picking the claim of a statistically significant effect (p=0.026) on the control group is wrong. 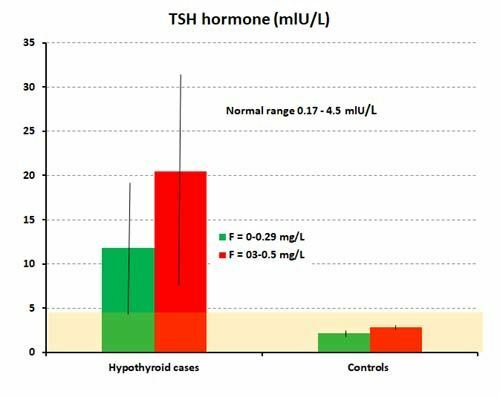 The authors claimed significant differences of TSH hormone with fluoride concentration for both the control and hypothyroidism groups – see Figure. The TSH levels for the control group was in the normal range (yellow area) and the difference (although statistically significant, p=0.001) was extremely small. The levels for the hypothyroidism cases were outside the normal range – probably as a result of hypothyroidism. Again, I wonder at the claimed statistically significant effect (p=0.003) of fluoride for the hypothyroidism cases. While hypothyroidism prevalence was not significantly related to fluoride concentration the study reported that it was related to gender, family history of thyroid disease, water consumption, exercise, diabetes, and hypertension. The authors note that “patients with hypothyroidism . . . have a higher consumption of drinking water.” So this association probably means increased water consumption is a result of hypothyroidism and not a cause of it. The authors seem to have an anti-fluoride bias, and I wonder at studies which demonstrate statistically significant relationship for a range of risk-modifying facts, but not for fluoride, yet still concentrate on possible fluoride effects. Particularly at such low fluoride concentrations. That is just special pleading – trying to “save” a non-significant result. And special pleading to compare it with the Peckham study which has been roundly criticised for not considering the effects of iodine deficiency which is known to be a major contributor to hypothyroidism. 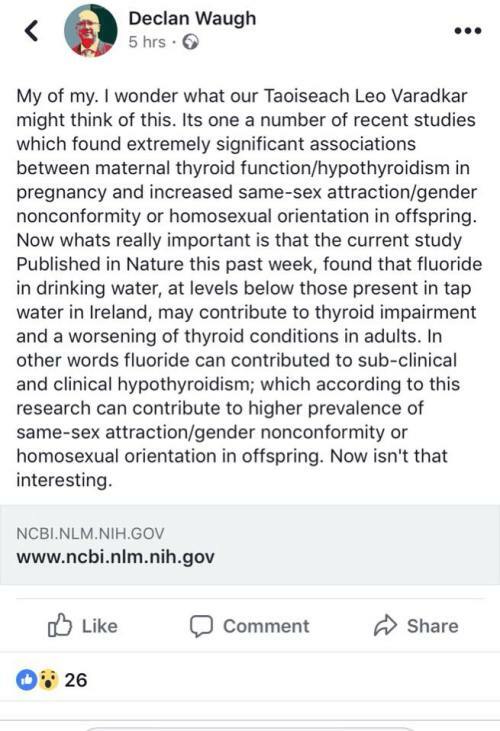 They have turned this water consumption on its head – now ignoring that it is caused by hypothyroidism (patients drink more water) and claiming the TSH changes are a result of increased fluoride intake. This is simply an attempt to overcome the lack of any statistically significant effect due to fluoride levels in drinking water by postulating there is really an effect because of increased water consumption by hypothyroidism patients. I do not think this is a good paper. Decent peer review could have improved it – and hopefully removed the obvious bias and special pleading of the authors. It cannot honestly be used to claim fluoridation causes hypothyroidism – as anti-fluoride campaigners will do. However, activists will dredge out quotes from this paper which will be used to give an impression of results actually not present in the paper (fluoridation causing hypothyroidism). So a paper which actually doesn’t support anti-fluoride claims – but can easily be misrepresented to fool the uncritical reader.